Recycling old soda bottles is probably a good idea but double check any vintage Coke containers before saying goodbye. Any die-hard collector of vintage goods knows that patience is a virtue. Sure, curating a wall of old keepsakes is a fun past time. But perhaps the most exhilarating part of collecting happens when you realize that the dusty old toy, shoe or even bottle you've been keeping around for decades is worth a lot more than you originally paid for it. Like vintage Pyrex or Tupperware pieces, some old Coca-Cola bottles may be worth their weight in gold — and then some. Recently, a rare Coca-Cola glass bottle from around 1915 was put up for auction with a minimum bid of $50,000. However, the Las Vegas-based auction house Morphy Auctions currently has the bottle valued between $100,000 to $150,000. According to the auction house, this particular model is believed to be a part of the original, unseen sample designs tested by Coca-Cola in the early 1900s. That testing period occurred before the final bottle was selected and produced nationally in April 1917. All other test models are believed to have been destroyed, so this one stamped with its original "Atlanta" embossing, with Coca-Cola stamped on the bottom "heel," is rumored to be the only one of its kind in mint condition that exists today. 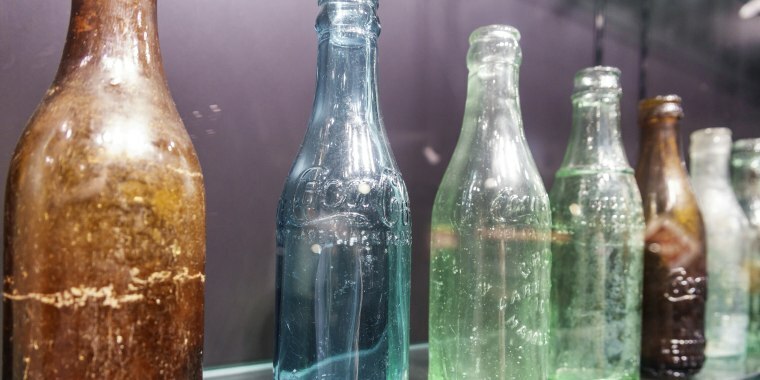 According to the auction house, the very rare item was discovered recently, just days after it had obtained and sorted through "a Coca-Cola collection acquired from a retired Coca-Cola employee who worked for Chapman Root," an old Coca-Cola bottling plant in Indiana. While this particular bottle is special in its uniqueness (and high value), it's not the only one that's worth six figures. In a similar prototype was discovered in 2011, and eventually sold for $228,000. While not all vintage soda bottles will help you pocket a small fortune overnight, there are plenty of collectible bottles that are worth more than any drink. According to Country Living, many vintage soda bottles (from the early 1900s through the 1970s) are pretty easy to come across and can sell for $10 to $30, depending on whether they were part of a limited release. A Hutchinson-style bottle (known for its wired stopper) in great condition, which the Coca-Cola Company says were its first bottles manufactured in the mid-1890s through the early 1900s, are harder to find as there were only a few dozen varieties distributed in Alabama, Georgia, Tennessee and Mississippi. These bottles with script letter logos range from $2,500 to $4,000. Another type of Coca-Cola bottle to look out for is one with amber-colored glass and straight sides, which the company says was issued right after the Hutchinson model. Love to Know Antiques stated that this type of bottle recently sold for $43 on eBay. Coca-Cola calls these bottles a "gold mine for collectors" because there are so many available in many different sizes, colors and markings, that will rake in anywhere from $25 to $400. Now that it's officially spring-cleaning season, when you're clearing out the attic, double check any old soda bottles before tossing them out. Better yet? Next time you're at a garage sale, don't skip over the glass section. Look out for the manufacturing date stamped on the bottle somewhere — if it's pretty old, don't hesitate to shell out a few bucks for something that may be worth thousands one day.